(v. 9) Rejoice greatly, O daughter Zion! (v. 28) After he had said this, he went on ahead, going up to Jerusalem. Because we know the end of the story, the temptation is to rush to the cross of Calvary then to the empty garden tomb. But, one must linger over the potential of this day for it is crucial. It is a time when people realized in great numbers who Jesus really was and a time when people had to deal with unmet expectations. Instead of a crown, Jesus found a cross; but this unexpected pitfall could in no way diminish the victory that was at hand. Thus, this is an occasion both to celebrate Jesus as King, and to acknowledge our uncertainty about how this kingship will be manifest in our lives. For the first four or so years of my ministry, God seemed to ordain that I preach on Palm Sunday. It has always been for me a joyous celebration, pregnant with potential for God’s in-breaking power to emerge in a new way in the world. Next to Easter, I enjoy no occasion more, even though I realize that the jubilation of palm branches will suddenly shift its focus to the jagged edges of an old-rugged cross. This contrast, in my estimation, can only be fully understood by fully living into the celebration before mourning races in and settles in upon us. The Gospel of Luke portrays this time in Jesus' life as a time of great expectation and exultation. The people were obviously weary of the Roman occupation. They had been hearing rumors of a great teacher from Nazareth who healed the sick, fed the hungry, and made the scriptures come alive. Some of them had seen miracles first hand and had heard parables straight from Jesus' mouth. Now, they had a deliverer; their long awaited Messiah and Savior, King Jesus, was with them. Expectation, exuberation, and exultation filled the air; this was the scene for the victory celebration of “Palm Sunday.” The people were expecting change, a major change, a change never seen before in their world. God was going to do something special in their time. God was about to transform their daily world of trouble into a perfect, holy, just city of grace—a New Jerusalem, a paradise where God's will was done by everyone. Our African ancestors might have described it as a place where “everyday was Sunday and howdy and never goodbye.” And most importantly, standing in their midst was the Messiah, King Jesus, himself. It should not be hard for us to understand their sense of joy because we live in a world where we as a people have been oppressed, abused, treated unjustly, and denied opportunities just because of our ethnic heritage. We can understand their joy because we have seen people that look like us brutally beaten for no apparent reason. Because we can understand their pain due to the iron hand of Roman oppression, it is not hard for us to imagine what it felt like when the word got out that the Savior is coming, our troubles are ceasing, and the Kingdom of God is arriving! There is not much that is mightier than the belief that a better day has come. As Jesus rode into town on a colt, he brought to mind the image in Zechariah 9:9 of the promised king humbly riding on a colt. The people recognized this image and knew that this man was the king whom they had been looking for. They were rejoicing, celebrating the goodness of God who had given them their new king. In their great joy, Luke describes the people casting their cloaks on the ground making a path for the Lord; and John, who provides the name for this occasion, speaks of people waving palms of praise in the air. 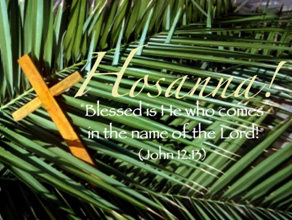 It is this joyous arrival that we celebrate today on Palm Sunday. The people gave their all in joy to pave the way for the coming of the Kingdom. Imagine the type of commitment and the excitement it takes to remove your clothes from your body and cast them in the street. Some of these people were poor and may only have owned one cloak, yet they cast them on the ground so that their new king would have a royal pathway on which to walk. What would this world be like if we were so excited about our relationship with God that we committed all of our time, talent, and treasure to spreading the Gospel, to feeding the inner city poor, to visiting and praying for the sick and shut-in, to comforting the discouraged who struggle with drug abuse and other addictions, to seeking justice for those treated unjustly by the prison system, and to sharing hope with hopeless young men and women? This Palm Sunday type of commitment would be a “casting off of our clothes” in order to welcome King Jesus who wants to walk and talk in the streets of our communities. “Casting off” would replace our usual complaining about all that is wrong with the world. So I ask how would the world change if, because of our joy in Christ, we gave our all to God and others? Could it pave the way for the coming of the Kingdom of God? The cloak-removing folk in Luke had experienced the coming king and they could not keep quiet. They could not keep it to themselves! In front of their friends, family, coworkers, and even the leaders of their world, they proclaimed that they had found in Christ what they had waited for all of their lives. Such willingness to testify that God has done something amazing for us is a witness to the world, to those who do not know that “there’s not a friend like the lowly Jesus.” King Jesus had done something in their lives and that was reason enough for them to say something! How about you? Because of Christ, there is a pregnant possibility that we will be victorious over the powers and principalities that have oppressed and abused us. We have hope because our God is in this house! Our God is with us! That’s reason enough to celebrate, to sing God’s praise, to tell somebody. Textures:The texture of the skin of the colt; the smooth texture of the palms; the feel of the varieties of fabric of the cloaks that were thrown on the ground.